WASHINGTON — President Donald Trump on Wednesday interviewed four potential candidates to lead the FBI, including former Connecticut Sen. Joe Lieberman, former Oklahoma Gov. Frank Keating and Andrew McCabe, currently the bureau’s acting director. Trump also met with Richard McFeely, a former top FBI official. Attorney General Jeff Sessions participated in the interviews. The meetings came more than a week after Trump fired James Comey from his post as FBI director. Trump said Monday that the search for a successor to Comey was “moving rapidly.” He also has said he could name a candidate by the end of the week, before he departs Friday afternoon on his first overseas trip as president. The Senate must confirm whoever Trump nominates. Press Secretary Sean Spicer informed reporters about the meetings as Trump flew to Washington after addressing U.S. Coast Guard Academy graduates in Connecticut. McFeely departed without comment. Reporters did not see McCabe when he left the complex. Lieberman served in the Senate for more than two decades and was the Democratic vice presidential nominee in 2000 with then-Vice President Al Gore. Lieberman lost his 2006 Democratic primary bid but won Senate re-election as a third party candidate. Lieberman spoke at the 2008 Republican National Convention on behalf of his friend, Arizona Sen. John McCain, and did not seek re-election in 2012. He has served as co-chairman of No Labels, a centrist group that promotes bipartisanship. Keating, a Republican, was a two-term governor of Oklahoma and led the state during the deadly 1995 bombing of a federal building in Oklahoma City. A former FBI agent, Keating served in the administrations of Presidents Ronald Reagan and George H.W. Bush. McCabe became acting director following Comey’s dismissal on May 9. The veteran FBI official made headlines for congressional testimony last week that rejected the White House’s claim that Comey had lost the support of rank-and-file agents. He also disputed the administration’s characterization of an investigation into potential coordination between Russia and the Trump White House. Several other candidates have withdrawn from consideration, including Rep. Trey Gowdy of South Carolina and Sen. John Cornyn of Texas, both Republicans; Alice Fisher, the former head of the Justice Department’s criminal division; and Michael Garcia, a former U.S. attorney from Manhattan. Associated Press reporter Eric Tucker contributed to this report. Left: Clockwise from top left: Former Oklahoma Gov. 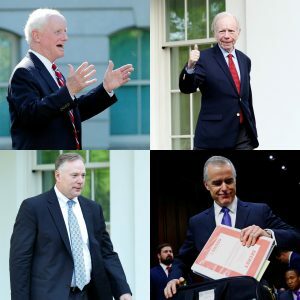 Frank Keating, former Connecticut Sen. Joe Lieberman, Andrew McCabe, the FBI's acting director, and Richard McFeely, a former top FBI official. Photos by Reuters.